My Favorite Sport/Game – There are many sports. Among them, cricket is my favorite sport. It’s very interesting but costly. It keeps our body sound and strong. The game of cricket needs two teams of which each team has eleven players. It needs a big ground to play. Bats, balls and two sets of stumps are also needed. Two umpires conduct the game. Sometimes a third umpire is required to solve acute confusion. At the beginning of the match, a toss is adapted to select a fielding group and a batting group. The batsman may be out in many ways. He may be bowled out, run out, stumped out and caught out. When a bowler bowls, a batsman hits the ball away and changes position with his partner before the ball is received at the wickets. Thus, one run is scored. If the ball crosses the boundary line, four runs are made. If it flies over the boundary line, six runs are scored. After the interval, the fielding group comes to bat and the batting group goes to field for fielding. The team that scores more runs wins the game. The duration of the game depends on the fall of wicket or completion of the over. 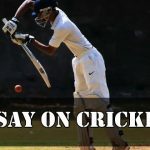 Cricket is very popular all over the world. I like it very much. My Favorite Sport/Game – The name of my favorite game is football. The football field is 120 yards long and 80 yards wide. The two-goal posts are placed at the two ends of the field. The field marked by boundary lines on four sides. The game is played between the two teams. Each team has eleven players. Among the players of each team, there is one goalkeeper, two full-backs, three half-backs and five forwards. There is a referee. He conducts the game with a whistle. In the beginning, the ball is placed in the middle of the field. The referee blows his whistle and one of the players kicks the ball and the game starts. No player except the goalkeepers is allowed to touch the ball with his hands during the continuation of the game. 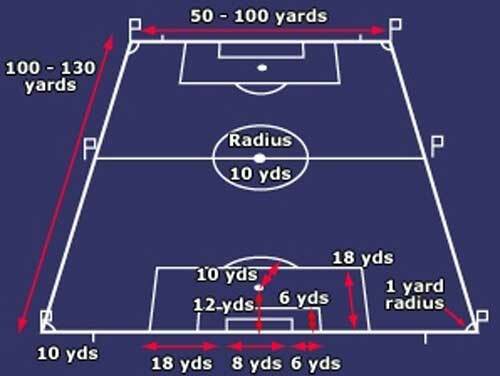 If one of the players of a team passes the ball through the goal post of the opposite team, the team is said to have scored a goal. The team that leads in the number of goals is declared the winner. The referee conducts the game according to specific rules. There are also four linesmen in the game who stands in the corners of the field to assist the referee. The game is divided into two parts of 45 minutes each. There is an interval of 15 minutes between the two halves. In the case of knock-out games, extra time and at last tie-breaker is allowed if no result is reached within the given 90 minutes. My Favorite Sport/Game – I am a great lover of games and sports. In fact, a game is a part and parcel of human life. Though football is a foreign game, it has become one of our national games. Nowadays. football is played in every nook and corner of the world. There are various types of games outdoor and indoor. Of all the outdoor games, I like football very much. I have taken part in many indoor and outdoor games such as – Hockey, Badminton, Cricket and Lawn Tennis. But no other game appears to be so interesting and thrilling as football. Football is played in a large playground. It is 110 to 120 yards long, and 70 to 80 yards broad. There are two goal posts at each of the two opposite ends of the field. Each post has a bar on them 8 feet above the ground and a net is filled with the bar. Football is played between two teams. Each team contains eleven players. The game is conducted by a referee with the help of two linesmen. A ball is placed at the center of the field. The players on each side take positions on either side. As soon as the referee blows the whistle, the ball is kicked off and the play starts. Each team tries to score a goal against the other. The game usually lasts for ninety minutes with an interval of 10 minutes. Football is a very favorite and enjoyable game almost in every country of the world. It teaches us discipline and co-operation. It makes us smart and prompt. It is also a kind of physical exercise. Football is undoubtedly a popular game. All classes of the people-old and young love this game very much. It is full of the thrill for both the players and the spectators. Sometimes the players enjoy the game more than the spectators. In a word, we can say that it gives us immense joy and pleasure. My Favorite Game Football Essay. My Favorite Sport/Game – We all more or less fond of sport. My favorite sport is football. It is not an indigenous game. It came from England. Nowadays, it is an international game and played almost in all countries of the world. It is also very popular in our country. It is really an exciting game. Among all the games, I like it most. There are many reasons for which I like football most. No game is so exciting as football. If thrills not only the players but also the spectators. It is one of the outdoor games. A man gets more opportunity to move his limbs through playing football. That works as physical exercise. It lasts for one and a half an hour. That is very short. So, to play this game we have not to waste more time. Besides, the rules of this game are very easy to understand. It is also our national game. For all these reasons, I like this game most. The game is played between two teams. Each team has eleven players. The referee conducts the game. The players’ are-one goalkeeper, two backs, three half-backs and five forwards. The ball is placed at the center of the field. The referee blows a whistle and then the game starts. There are two linemen to help the referee. None but the goalkeeper can touch the ball with hands. The referee’s decision is final in the game. There are many merits of the game. It develops the qualities of discipline, generosity, cooperation, carefulness, brotherhood, comradeship etc. It also helps to improve the health of a player. Because it is a good means of taking physical exercise. It has some demerits too. Many students spoil their studies in their craze for football. Sometimes it creates quarrel among the players and spectators. It often becomes the cause of an accident. Because it is one of the risky games. In the long run, it can be said that in spite of having some bad sides, the merits of the game are more. It is really an interesting and exciting game. It is also very conducive to health. My Favorite Sport/Game – Introduction: The name of my favorite game is football. It is a very popular game. It is played all over the world. Description of the Game: The game is played between the two teams. Each team has eleven players. Among the players of each team, there is one goalkeeper, two full-backs, three half-backs and five forwards. There is a referee. He conducts the game with a whistle. In the beginning, the ball is placed in the middle of the field. The referee blows his whistle and one of the players kicks the ball and the game starts. No player except the goalkeepers is allowed to touch the ball with his hands during the continuation of the game. If one of the players of a team passes the ball through the goal post of the opposite team, the team is said to have scored a goal. The team that leads in the number of goals is declared the winner. The referee conducts the same according to specific rules. There are also four linesmen in the game who stands in the corners of the field to assist the referee. The referee is the sole judge in the matter of the field. Conclusion: Football is an interesting and captivating game. To be able to watch a competitive football match is a joy for me. That is why I like this game the most. My Favorite Sport/Game – My favorite game is football. It gives me great joy. It is not expensive, too. Football thrills not only the players but also the spectators. Football is not a game for our country. It is a foreign game. It came from England. But it is popular all over the world. Football is played in an open large field. The ground is 110 to 120 yards long and 70 to 80 yards wide. There are two goal posts at each of the two opposite ends of the field. A bar is tied to the goal posts which is eight feet above the ground. There are also center and penalty box. The game is played between two teams. Each team has eleven players. There are a goalkeeper, two backs, three half-backs and five forwards on each side. The goalkeeper and the two backs play on the defensive while the five others lead the attack towards the opposite goal. The half-backs play on the defensive and lead the attack also. A ball is placed at the center. A referee conducts the game. As soon as he whistles, the game starts. Each team attacks the opponent and defends its own. The whole game is divided into two equal halves with an interval of ten minutes. At the end of the first half, each team changes its side. When a team nets a ball to the opponent’s goal, the players, and supporters of that team are beside themselves with joy. The party that scores more goal than the other wins the game. The game is played by rules. The players abide by these rules and show respect to the decision of the referee. Merits of the football game are too many to be described. First of all, it makes a man strong, healthy and wealthy. It teaches many moral qualities, obedience, co-operation, discipline, tolerance punctuality etc. There is no unmixed good on earth. Football has some demerits too. Sometimes the game leads to the bitter quarrel. In spite of the little demerits, football is my favorite game. Through this game, one can learn and acquire many good qualities and virtues of head and heart. A man can also earn a lot through the game. Essay on World Cup Football – The World Cup Football is popularly known to all and sundry. It a people’s game and passion around the globe and the prestige of many key soccer playing nations is at a stake or a culminating point. It was organized by FIFA. Jules Rimmet, the then President of FIFA, contributed immensely towards the initiation of the World Cup Football and the subsequent popularity of the game. The World Cup is organized after every four years. The first world cup was organized in Uruguay, 1930. Thirteen nations participated in it for the first time. Uruguay won the World Cup defeating Argentina in the final match. The second World Cup organized or played in Italy in 1934 was participated by sixteen teams. Italy won the cup defeating Czechoslovakia in the final match. The 1938 World Cup was organized by France. Italy won the cup once again defeating Hungary because of its team was in full form. Unfortunately, the 1942 and 1946 World Cups were not organized for two World Wars. The 1950 World Cup was contested by Brazil, the host nation, and Uruguay. Uruguay won the cup in the final tournament. The 1954 World Cup organized in Switzerland was played between Hungary and West German. West German won the cup by dint of scoring a goal six minutes before the final whistle. The 1958 World Cup organized in Sweden and the final match was contested by Brazil and Sweden. Frenchman was the top scorer who scored 13 goals, a record to date for Brazil. Then Brazil won. The 1962 World Cup was hosted by Chile. Brazil and Czechoslovakia contested for it. Dragin scored five goals to his credit. Brazil defeated Czechoslovakia and won the cup. The 1966 World Cup was organized in England which was seriously contested by England and West Germany. England won the cup defeating West Germany by 4-2 goals in the final match. In 1970 the World Cup was hosted by Mexico and the final match was contested and played by Brazil and Italy. Brazil won the cup defeating Italy by 4-1 goals. Gerard Moeller scored 10 goals in this tournament. German won the 1974 World Cup defeating Holland, Argentina won the cup in 1978 and the cup was won by Italy defeating Germany in 1982. Maradona was the star player for Argentina in the 1986 World Cup. Argentina won the cup by dint of Maradona’s magic scoring the maximum number of goals. The 1990 World Cup was played in Italy for the final match played between Germany and Argentina. Germany won the cup defeating Argentina. MU Brazil won the 1994 World Cup defeating Italy. Brazil became the undisputed scorer by annexing the World Cup four times. The 1998 World Cup was organized in France. Thirty-two teams participated in it. This was the greatest sporting show on earth. The finals were held in Paris. France also defeated Brazil by three goals to nill. The 2002 World Cup was sponsored jointly by Japan and North Korea. The inaugurated match was played in Korea. Brazil won the cup defeating West Germany in the final match played in Japan. It was decided that the 2006 World Cup would be held/played in Germany.